The stratigraphic legend in my project should be (Fill>BD>MD>Coll>All>Sap) from top to bottom. Some of the logs reach the bottom layer and some of them are too shallow to reach Sap. I found that one layer (All) is missing in the 2D plot , but it is observable in the 3D plot. So I wonder if there are some discrepancies in running the 2D plot and 3D plot. I know that this problem maybe due to the blank row for the Sap layer, as I found that the 2D plot appears to have no problem when I delete the last blank row. But I wonder if there is some problem for the interpolation of section/profile when the empty row is deleted. I think I responded by email to your co-worker, who had the same question. Deleting the blank Sap entry will solve the problem with the 2D log, and will not cause any problems with the interpolation of the stratigraphic model (since it was not contributing any data points to the modeling). I do notice that the formation order (Fill, BD, MD) is not consistent with the depth sequence - MD is above BD? 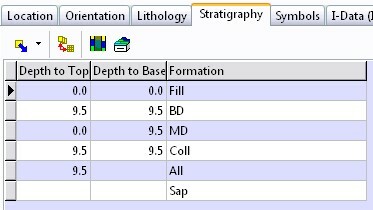 In the Stratigraphy data tabs, the data is sorted by formation order, so that you can quickly see if the sequence is incorrect. Please note that data-specific questions such as this may be more easily addressed via email than in the forum. Feel free to email me if you have additional questions.